The Brechin Hill neighbourhood plan steering committee just gave me a copy of the draft of the “Newcastle + Brechin Neighbourhood Plan.” The steering committee has had it for about three days. I’ve had a brief look at it, and I was exposed to the raw, exhausted emotion of the steering committee. From what I’ve seen, I would say this is a neighbourhood plan in name only. Here are the offending bits of the draft copy of the Newcastle+Brechin Neighbourhood Plan. These bits are key. With these bits the rest of the plan is useless as in un-do-able. Without these bits, the community might have a chance. If this was modified to conform to a Medium Density Neighbourhood then we probably would see progress. Click images to enlarge. The most contentious issue is waterfront development along Stewart Avenue. 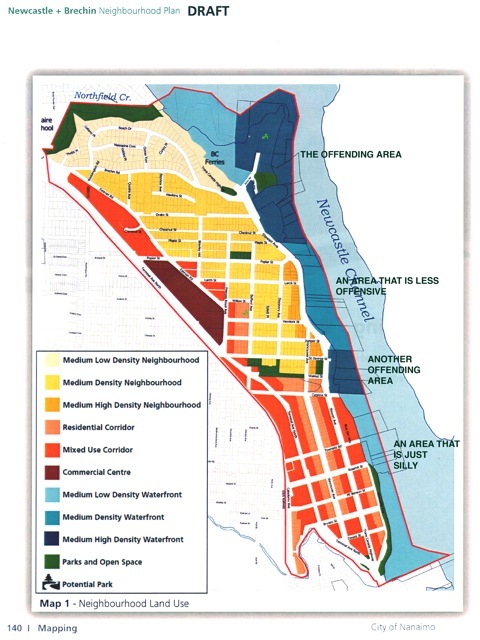 Here the city is allowing unlimited development with densities equal to the downtown core. This is so destabilizing, as far as the neighbourhoods are concerned, that there is virtually nothing else to discuss. Still, the steering committee is gamely producing a very long list of additional objections. More on these objections in later posts. For now the prospect of towers on the water front becomes an ever increasing inevitability. I can’t help thinking that the anemic resistance to the tower proposal at Port Place Mall indicated to the city, that the time was right to give a handful of property owners along the water front carte blanche. This document does nothing more that assure these few people that they can retire wealthy and move to a warmer climate. I do think the opposition to this so called, ‘neighbourhood plan’ will be much better organized. The property owners in Brechin Hill have got something very specific and very significant to lose if this plan is accepted by council. For now, the steering committee is in the process of distributing information to their neighbourhood. They are at the beginning stages of forming a organization along the lines of FPN. They are organizing presentations for the upcoming Plan Nanaimo Advisory Committee and then the Council Meeting that will ultimately decide their fate. The principle involved here is the right of a Council to take property value from one or more citizens and give it to another, with or without benefit to the general public. In this case we are dealing with the “view” values which will be taken from some and given to others. The kernel of the problem for a Council which is supposed to represent all of the city’s citizens is a determination of whether there is sufficient overall public benefit to the city as a whole to justify what amounts to expropriation, in this case of view. The possible public good could be argued to be increased density or tax revenue gains. But of course these same increases could be derived by moving the high rises to the top of the bank where all could have a view. The problem results from our geography and could be solved by our geography. If we were on the prairies and had no waterfront these questions, and many other development issues that both plague and benefit Nanaimo would be moot. But we are not. To build highrises on the waterfront is to foreclose significant development behind that wall and to permanently devalue property in the gulch thus created. So the question seems to be stuck at the point of whether City Council is responsible to those who live here now, or to those they hope to entice here. One suspects that voters who are aware will chose their own interests over those of yet-to-comers. But this is not what happened in the case of the conference centre. Once again, citizens will be making a choice of whether to support each other -and each others neighbourhoods- or to wait for the hand of “development” to pick their pockets. Mobilized activist neighbourhoods might be our best hope for finally creating real change for the better at City Hall. I’ll be eager to hear more Dan. Is this the draft plan? Stage 4? or have they moved beyond it? Yes, this is the Draft Plan as presented to the Steering committees. Since single family dwellings are not a positive tax benefit to the city, and high rises seem to be, given we seem to have no other strategy for paying the bills, what else are they gonna do? Arguably a high rise on the waterfront, is of greater commercial value than one on the hill. Jim, you require a very complicated answer for a simple response. What we are asking the Brechin Hill residents to sacrifice their property values so that we can get development to subsidize the provision of all our services. That seems wrong to me. But on top of that, its not how it works. The asset that the Brechin Hill residents bought and paid for, is been taken away and given to developer’s who liquidize that asset and leave with their new wealth. Then we pay taxes to service whatever is left. We only gain if what ever is left costs less to service. And for the most part a multi-family unit of any size, costs about the same to provide service to. That is a simple as I can make it, probably because there is a lot there I don’t understand. Ranting is just that. Make the democratic process work for you. If you really want to make a difference, then you could help the neighbourhood write their own plan, it’s their community not the kleptocrats in City Hall. You can use the draft city document as a template. Get the steering committee to take on this work, run your own consultation process, hold a town hall meeting, get the media out and document the support. Present the draft directly to Council for Adoption, make your own recommendations; after all there are more votes in your neighbourhood than there are in City Hall. 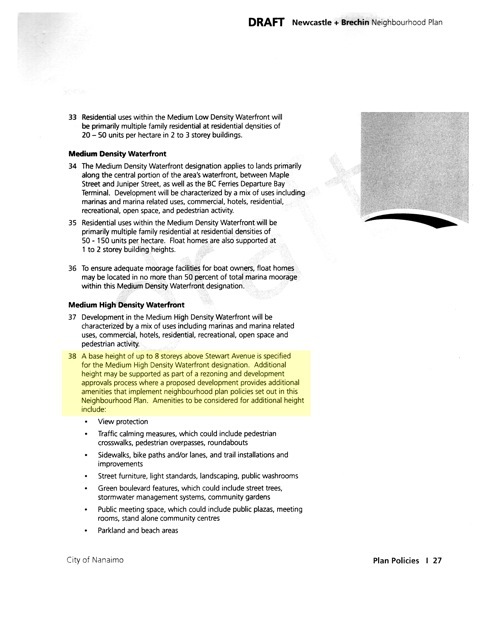 Cable Bay (Oceanview) wrote its own OCP Masterplan and got it adopted, it’s not as if the idea doesn’t have a precedent! The community has been working on its own plan for the area, and I have been helping them. The problem is the city has been working against this effort, and is in no way obliged to accept the alternative plan. The hill we have before us is extremely steep and very daunting. There is a great deal of work that needs to be done to get the cities’ plan rejected, so that the way is clear the way for something more equitable, sustainable and doable. Those involved are determined, but very frustrated and tired. Right now they feel that the process is not democratic and it is not working for them, but I don’t think they are degenerating their arguments into a rant. These are people who by nature are very positive, very open to new ideas, and very willing to pitch in and help a just cause. They are doing what they can to make a bad situation better, and I am doing what I can to help them succeed. Dan’s concerns and his efforts to assist the Brechin Hill neighbourhood is very laudable. Could I suggest that the situation brings the possibility of a political solution. If the residents were to organize their neighbours, and others who are interested in fundamental change at City Hall, they could form a formidable voting bloc. The next municipal election is just over a year away and the opportunity is there for a single issue bloc to withhold their votes from (most, but not all) current Council members and work towards electing 2 or 3 really thoughtful new candidates. It wouldn’t take many to swing the balance of power from stupididy to common sense. Good thought Wayne. I continue to think the neighbourhood associations have the potential to be politically active and work to get people elected who can champion neighbourhood issues. A good place to start for anyone looking to get involved. The associations right now I think it’s fair to say don’t see themselves as politically active or activist and I think that’s a shame. The South End Community Association http://seca1.wordpress.com/ (the most high profile and proactive about reaching out to their neighbourhood. Gord Fuller who posts and comments here is a director) and the Nob Hill group are organized around specific issues. The Nanaimo Old City Association http://www.oldcitynanaimo.org/ have an AGM coming up on Oct 18. I don’t think they’ve announced the hall yet though.